At last the summer holidays are here! 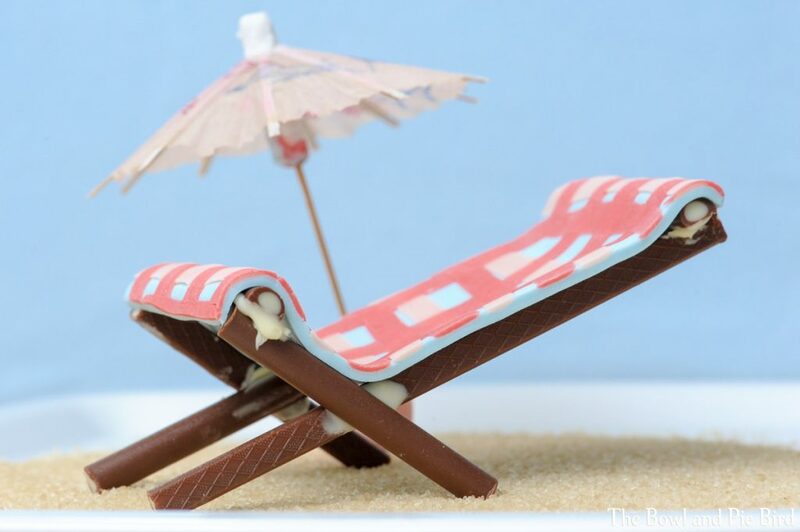 I made this deckchair from chocolate sticks and fondant. 100% edible and 0% plastic. Relaxing, sleeping in, swimming in the sea, wiggling your toes in the warm sand. But wait a second, what’s that? A plastic bag, a bottle cap, a yoghurt pot!? Unfortunately this is a typical sight on nearly all beaches nowadays. 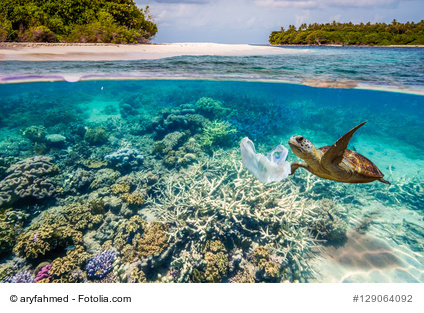 Safe from human intrusion maybe but not safe from human garbage as the recent article from National Geographic shows: Our plastic waste is carried far by the ocean currents even to the most remote and uninhabited islands of the earth. Read the article on the Henderson Islands here. Pollution on the beach of a tropical island. Like turtles who mistake plastic bags for jellyfish. Jellyfish or plastic bag? Turtles don’t see a difference. Or birds who think that small plastic parts floating on the ocean are food. The Laysan albatrosses on the Midway atolls are a tragic example of how our plastic waste is causing harm and death on the most remote beaches of this planet. The photographer Chris Jordan has documented the life and death of these magnificent birds in his film “Albatross” which started screening in the US this year. Find out more on the film’s official website. And then there’s the problem of micro plastic. These are tiny plastic particles which either come from the plastic waste breaking up in the oceans or from cosmetic products such as shower gels with peeling granules or toothpastes. Where does the plastic come from? This infographic from the WWF (in German) clearly shows where the trash in our oceans comes from: Over land via waste water and rivers, from cosmetics, from ships, from the fishing industry and from our beaches. 1. Pick up the trash – „It doesn’t belong to me“ doesn’t count. I carry a bag with me nowadays when walking along beaches. 2. Smokers – Even if it’s not plastic – please don’t throw your cigarettes into the sand but collect them in any old pot and then throw them into a bin. Birds mistake these stubs for food too. 3. Take your trash with you – At the end of a hot day at the beach you want to get back to the hotel/apartment as soon as possible. Some people just leave their rubbish on the beach. The garbage guys will deal with it. Often enough, however, it is the wind which blows the rubbish into the ocean. So, take your garbage with you. This applies to park visits or summer BBQ at riversides as well. 4. Try to avoid plastic – Yes, very difficult I know. But start with small steps like using soap instead of shower gels, choose glass packaging instead of plastic. The so-called “Zero Waste” fans can help you. The German blogger Shia from ”Wasteland Rebels”, offers uncomplicated and practical tips. Shia has listed a whole batch of English speaking Zero Waste bloggers; check them out here. I haven’t checked the figures for other countries yet, but in Germany despite rigorous recycling efforts over 50% of all plastic garbage is still burnt. 5. Avoid micro plastic – Don’t buy cosmetics or cleaning agents containing micro plastic. Certified natural cosmetics don’t include micro plastic. Greenpeace Germany has a big campaign running (check it out here ) and the website Fauna and Flora & Fauna International has put together various guides per country. Check them out here. Wishing you a wonderful rubbish-free beach holiday! 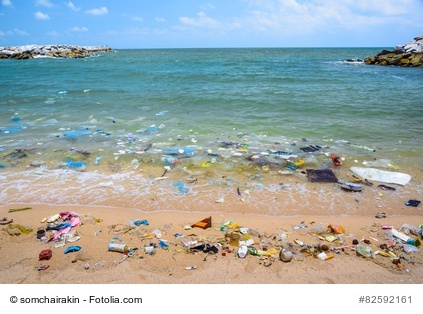 This entry was posted in Food for thought and tagged Environment, Meere, oceans, plastic rubbish, Plastikmüll, Umwelt.